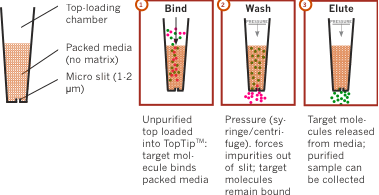 TopTip enables high-fidelity chromatographic separation of even ultra-low concentration samples. The fine 1-2 µm slit at the bottom of the TopTip permits liquid to pass through (with pressure via centrifuge or syringe), but retains chromatographicmedia in the tip. This eliminates the need for a filter – reducing dead volume, loss of sample and contamination risk. TopTip technology has powered research resulting in many publications: Explore literature featuring TopTip. Sold in packs of 96, except for TT3, which are sold in packs of 20. Click the button below to add the TopTip to your wish list.